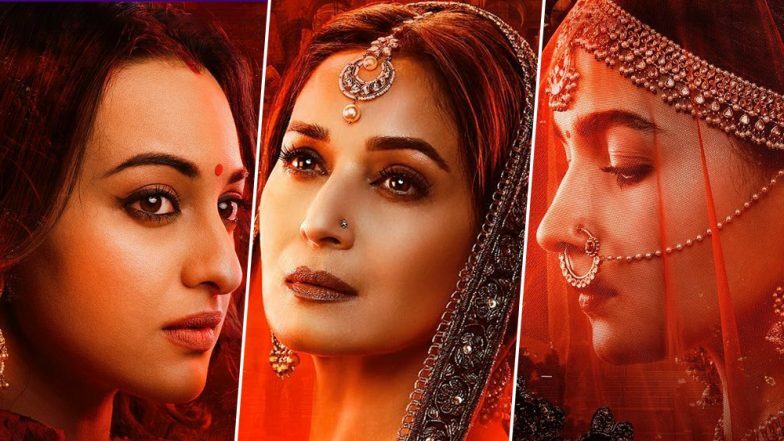 Karan Johar's period saga, Kalank hits the screens tomorrow and it's time to see the way Abhishek Barman has weaved some magic through it. Starring Varun Dhawan, Alia Bhatt, Madhuri Dixit, Sanjay Dutt, Sonakshi Sinha and Aditya Roy Kapur in lead, the film is essentially a romantic drama set during the partition era. And as we discuss the era of the late 1940s, it's crucial to see the way makers have highlighted the time span through its costume department. With elegant attires, a mix colour palette and simple silhouettes, it's not a layman's job to sketch outfits that will justify such a stellar star cast and the project's grandeur. Box Office Prediction: Will Varun Dhawan and Alia Bhatt's HIT Jodi Ensure the Biggest Opening For Kalank? Ace Bollywood designer, Manish Malhotra was in charge of designing outfits for all of its lead characters and we must say, his designs are noteworthy so far. In his recent interaction with Vogue, when he was asked about the entire experience, he said, "When I was offered Kalank, I was very excited because it’s my first ever historical period movie. I’ve worked on Mughal-e-Azam, but it was a period play. Kalank is Abhishek Barman’s [the director] interpretation of what happened between 1945-1947. Based in a town called Husnabad in Pakistan, the movie dwells in a fantasy world that Burman created. It’s a fictional world, leading up to the Partition of India. That era is very close to my heart, as my parents have lived through the Partition." Coming to Alia, Since her character goes through a lot of changes emotionally, her outfits range from pastel shades to deeper tones. While Sonakshi has mostly subtle shades that resonate with her calm demeanour, added the designer. Manish further revealed how he took references from the movies of that time and had long discussions with his mother for necessary inputs. Well, he has surely added some extra wow factor to Karan's grand vision and we can't wait to see more of them on the big screen.